Sign up for Broadjam today to follow Jacinta, and be notified when they upload new stuff or update their news! Launched at the Harbourside Brasserie Sydney Australia to a full house, the 'special edition' CD's sold out and Sandalwood is now into it's third pressing. 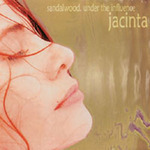 Inspired by a freakish journey into the depths of India, Sandalwood - Under the Influence is a luxurious collage of inspired melodies and progressive rhythms, encompassing a tantalizing spectrum of moods and styles. An uplifting mix of haunting sadness and a pinpoint of hope that will lead you from the ground and into the sky.